Mom, I’m bored! That used to be a common summertime complaint before the advent of video games. In the early 1970’s boredom was seldom a problem for my family. We lived thirteen miles from the city limits on a small mini-farm, and mowing grass, pulling weeds, shelling beans and shucking corn kept us pretty busy after normal work-day jobs. Occasionally, however, adults and kids alike wanted to do something totally different, so one morning we went exploring our neighborhood “forest.” Instead of the usual shorts and sandals we donned jeans and sturdy shoes, then tromped across the paved road from our house into a long stretch of unoccupied woods. The undergrowth was manageable, the ground cover mostly pine straw. Lifting our feet high we picked our way carefully through bramble bushes until reaching a little stream, a tributary of nearby Willow Creek. Turning south along the creek banks we spotted straggly bushes loaded down with ripe huckleberries. Ooooh! If we thought about germs they didn’t worry us, we just stuffed our mouths. Smaller than the commercial ones you can buy frozen at the grocery store, these wild blueberries were a tasty blend of tart and sweet. Visions of blueberry cobbler and blueberry jam filled my mind. What to carry the berries home in? Our combined tee shirt-tails weren’t long enough to carry many berries home, and besides I wasn’t sure I could wash that indigo color out without a great deal of bleach. We surveyed the creek bank to be sure we could find this spot again and trekked out of the woods, across the road to our house and collected an empty lard tin. Back in the woods we filled that tin half-full with huckleberries, scouring the bank north and south to be sure we didn’t miss a bush. Wild berry concoctions were a delicious staple of our diet for quite a while after that summer day. By the fall of the year house-and-garden tending got entirely too tedious again. We needed another break, something away from even the hint of all those chores. What to do? Go see the forty-acre rock, of course. Now, I didn’t know about the forty-acre rock, I’d never even heard of such a thing. But my husband knew somebody who knew somebody who swore it really existed, so early one Saturday morning into the car we piled for a day trip to Lancaster County. Wow, that’s all I could say. Doesn’t anybody else know about this place, I wondered? There were no billboards, no touristy-type advertisements along the way, but when we arrived there was an official sign and a lot of rock. I mean, a lot of rock! Today it is officially called the Forty Acre Rock Heritage Preserve and I guess the state doesn’t want a bunch of tourists trashing up the place. But it is open to the public, there are trails, and 1,567 acres in the preserve. The rock only takes up fourteen acres, not forty, but that’s still a lot of rock. We parked the car and headed down a narrow trail. 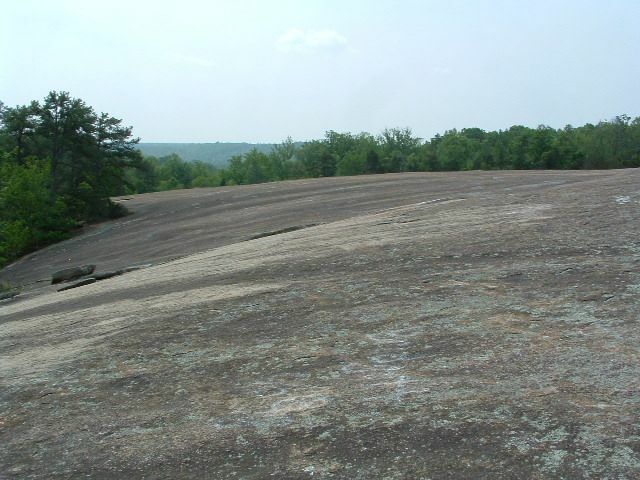 We soon came to the gigantic granite “forty-acre” rock, and with a sense of being on top of the world we stood there and gazed, slowly turning in a circle to take it all in. I had to admit, this is a very, very real place. After a few more minutes we continued down the trail, pausing beside a waterfall or stopping to look at the beaver ponds. Occasionally I kneeled down to examine unusual plants and pick a wildflower. Not a single other person did we see. It was a little creepy to be the only humans within sight, but all I could think as we made our way was what a wonderful, awe-inspiring place. We saw pine trees, oak trees and cedar trees, all sizes and shapes, little pools with lizards sunning on the bank and swirls of fish in the water. We had to use caution not to lose our footing when we came to tree roots or loose gravel on the trail. In some places water from the ground had seeped up into the path, trickling across to join a nearby stream. We stopped in the middle of a small bridge to listen to the water splishing as it crossed rocks just down the way. Except for our own “Did you see that?” and “Mama, mama, look over there!”, bird songs, water rippling and rustling of breezes in the trees were the only sounds we heard all morning. By lunch time our muscles and stomachs were ready to call it a trip and we reluctantly made our way back to the car. Cellophane wrapped sandwiches and bottle Cokes from home made up our lunch; there were no handy McDonald’s or Burger Kings in those parts, in those days. Now, I don’t know if huckleberries still grow down at Willow Creek or if that stretch of woods is even still there, uncleared and unoccupied. But if you ever get bored with house and garden chores, I can sure recommend a day trip to Lancaster County and the forty-acre rock at the Heritage Preserve.